CranioSacral therapy is a light touch technique that works to relax the soft tissue tensions on the nervous system. Since the nervous system controls everything within and of our bodies, any irritation to it can cause dysfunction in any system. By removing strains and irritations from the nervous system, it allows the body to self-correct and function to its best ability. 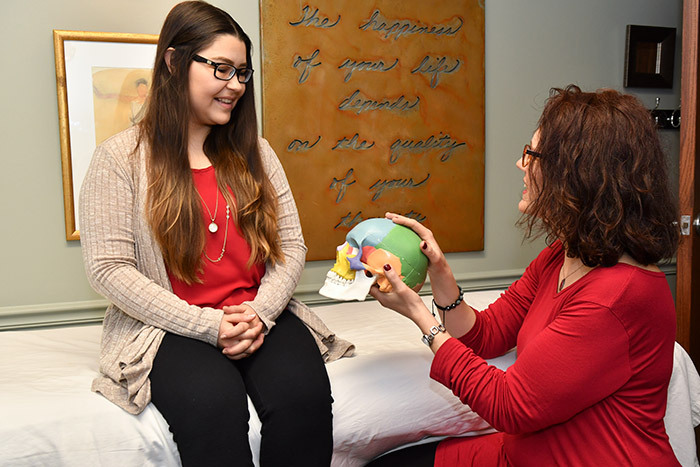 CranioSacral therapy can be used to treat headaches, TMJ syndrome, scoliosis, spinal pain, chronic fatigue, learning disabilities, brain and spinal injuries, colic, torticollis and many other conditions. Treatment sessions include evaluation and treatment to the whole body; primarily the head, neck, and back. Clients are fully clothed, resting in a peaceful room with serene music. The steady hand pressure is usually very light, approximately the weight of a nickel. Sessions are generally relaxing and most individuals fall asleep. CranioSacral therapy is beneficial to all ages – from children to the elderly. Jennifer Pillow-White is a nationally certified massage and CranioSacral therapist. She received her master’s degree in anatomy from the University of Detroit Mercy in 1996 and her massage degree through Irene’s Myomassology Institute. While still a student at Irene’s, she began her training in CranioSacral therapy with the Upledger Institute. Jennifer has continued her post-graduate training in this discipline. In addition to CranioSacral Therapy, she is also trained in Lymph drainage, Visceral Manipulation and KinesioTape techniques. In addition to being with Michigan Associates of Acupuncture and Integrative Medicine, she is on staff at Irene’s Myomassology Institute teaching physiology, pathology and Introduction to CranioSacral Techniques since 2008. She is an active teaching assistant and a certified instructor of Introduction to CranioSacral Therapy for the Upledger Institute. Furthermore, Jennifer teaches CranioSacral Therapy at Lakewood School of Massage Therapy. She is the certified study group leader for CranioSacral Therapy in the Metro Detroit area. Jennifer is an avid reader, enjoying fiction, medical history and anatomy. She loves organic gardening and practicing yoga, specifically Kundalini. She enjoys quiet time at home with her 6 year old twins, her husband and cat.